This display of nine anodised and powder coated aluminium decorative and functional objects reflects some of the rich tradition of unique and production line metalware in the Canberra region. Robert Foster, Marie Hagerty, Scott Chaseling and Aidan Macdonald all trained at the ANU School of Art; Hagerty in painting, Chaseling in glass, Macdonald and Foster in gold and silversmithing. Robert Foster is now an internationally recognised designer of both unique and production line functional metalware, including tableware and lamps. In 1993 Foster established F!NK (now F!NK and co.), a design and manufacturing company, where he leads a team of artists and designers in the production of contemporary functional objects. The sleek F!NK water jug in anodised aluminium has become a design icon of the twenty-first century, used in restaurants all over the world (and has appeared in a number of contemporary American films). 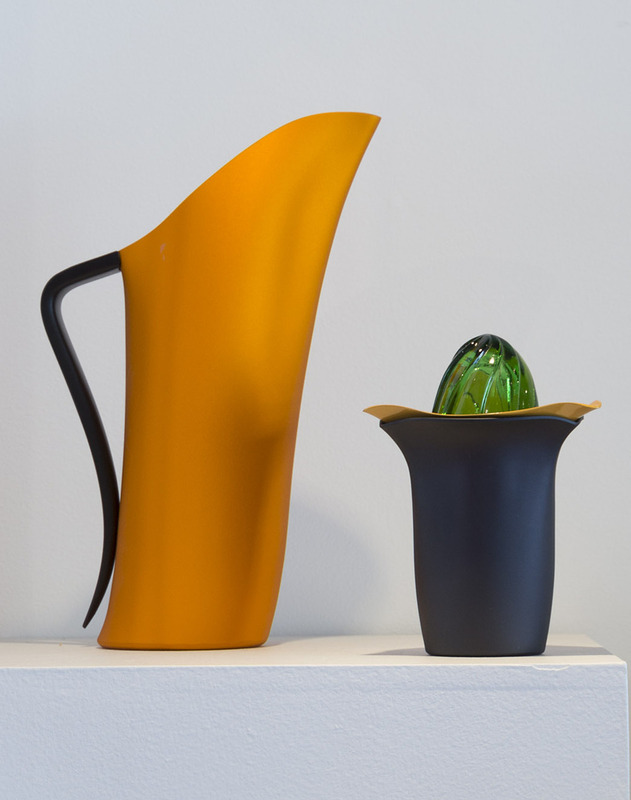 Vessels are the foundation of Foster’s practice: jugs, teapots, coffee pots, beakers and bowls, each invested with a distinct persona and singular resolution to the various functional, formal and aesthetic concerns of object design. Foster’s deft use of modern industrial materials, engineering skills and creative imagination combine to produce contemporary hollow-ware which is exceptional both technically and conceptually, and a synthesis of utility and fun. Marie Hagerty’s paintings oscillate between abstraction and figuration, and are full of contained energy, bold colour, trompe l’oeil effects, and references to historical modernism, in particular Russian constructivism and Bauhaus design. Hagerty and Foster’s overlapping interests in colour, organic form and blurring the boundaries of art and design combined in 2014 in a series of original objects – salvers, mirrors and mobiles – which were designed by Marie with Robert and then hand-made by Foster. They are sculptural objects that represent functional forms. Hagerty and Foster’s collaborative work will be shown in Sydney as part of Art Month this year, at the Australian Design Centre, 101-115 William Street, Darlinghurst, NSW 2010, from 3 March to 15 April 2016.